Cue the music, it is time for the big awards to be predicted and subsequently handed out as just two major awards remain here in Predictions Season. The AL and NL MVP Awards, which we will cover at a later date, and the hardware we will be handing out today for the American League and National League Cy Young Awards. The AL and NL Cy Young Awards go out to the best pitcher in each respective league and, again I am not saying this to incite a riot or really spark a debate, for that reason it is these awards that should, but don’t, disqualify a pitcher from winning either the AL or NL MVP Award. If a hitter could win the Cy Young Award, then sure. If not, then it just shouldn’t be allowed. My opinion only, just like these predictions are my opinion only as well. Leave your thoughts, comments, debate, banter and opinions in the comments section below or shoot us a line on Twitter by tweeting @GreedyStripes. Thanks in advance! 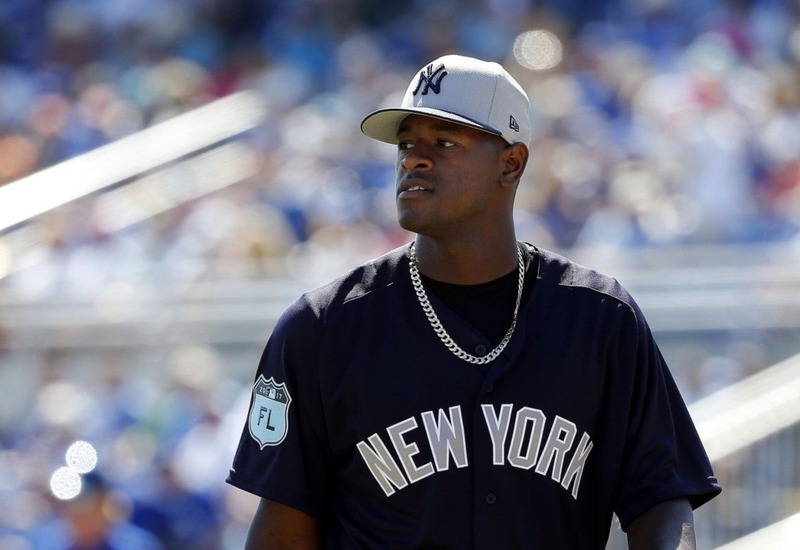 Will it finally be time for Luis Severino to shine? Will Masahiro Tanaka regain his dominance despite a lackluster spring? Is Sonny Gray finally going to get some run support here in the Bronx? Not likely. Not with the amazing bullpen that these young men have behind them and the undoubtedly short leash that they will all be on with new manager Aaron Boone presumably wanting to make a statement in his first season as an MLB manager. Boone will want as many wins as possible, and that in turn may mess with the win/loss records and peripherals of the Yankees starters much like it did under former manager Joe Girardi. With that said a New York Yankees pitcher will not win the 2018 American League Cy Young Award in 2018, but I truly believe that a member of the *pukes* Boston Red Sox will in Chris Sale. Sale had a down season in 2017 by many standards including a year where he did not record a victory against the New York Yankees. With the power of JD Martinez backing him in his starts and a few key bullpen pieces coming back from injuries and such for Boston I do not expect the Red Sox to go down quietly here this season, and I expect a much better campaign out of Sale. Unfortunately. I wanted to go with Max Scherzer in the National League, I mean I do have his team heading to the World Series and all in these set of predictions, but I wanted to go a little outside of the box with my predictions. With that in mind I am going to go with a member of those Philadelphia Phillies I predicted to do so well this season. No, I am not going with Aaron Nola. I said I wanted to go outside of the box. Instead, I am going to go with Jake Arrieta. Arrieta’s velocity is down and his peripherals are not trending in the right direction, but a change of scenery and a change into a more pitcher-friendly ballpark should only help the right-hander. Plus, in a simple world anyway, Arrieta should draw some easier matchups on paper with Nola being the “ace” of the staff, but really this is just a gut feeling I am having. Go with your gut, win a prestigious award, and look like a wizard in the making.